The internet has changed shopping in ways retailers may not be able to fight very effectively. There's no question that the world of retail is changing, with growth in online shopping dominated by Amazon (NASDAQ:AMZN) at the moment. But for everyday life, the move to online retail feels more like a trickle than a revolution. For example, I still shop at the grocery store multiple times a week, and Target (NYSE:TGT) on a regular basis, augmenting with orders on Amazon for random items. And for me, the shift to online shopping has been slowly taking place over the course of over 10 years. Walmart (NYSE:WMT) has always been a master of inventory management, which has been one of the keys to its long-term success. 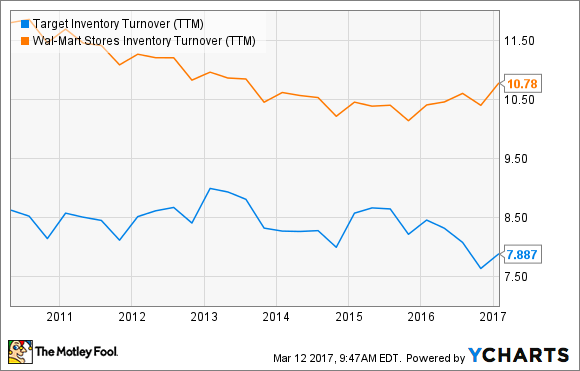 But over the last seven years, the number of times its inventory has turned over each year -- sales divided by average inventory -- has fallen 9%. The same percentage decline has happened at Target, which had slower turns in the first place. This challenge extends to suppliers, as well, and can be easily seen in the challenges of product companies like Fitbit (NYSE:FIT) and GoPro (NASDAQ:GPRO). They've been plagued by lagging sales, which leads to inventory writedowns, which leads to less investment in new products and a downward cycle for their businesses.